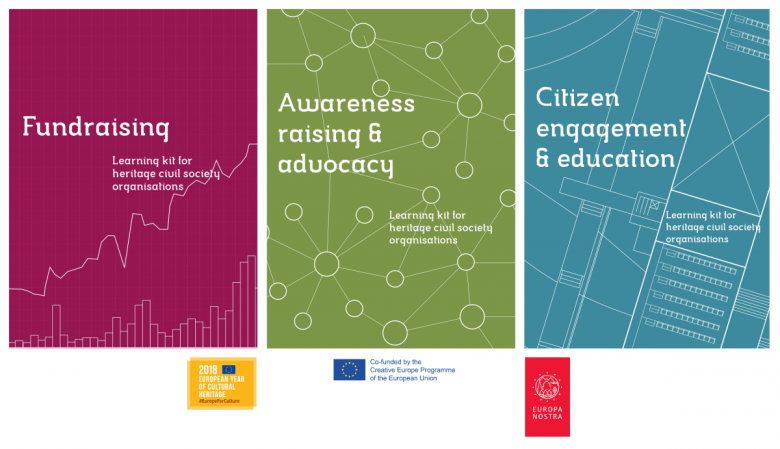 At the beginning of the European Year of Cultural Heritage 2018, Europa Nostra issued Learning Kits for heritage civil society organisations on three crucial topics: Fundraising, Awareness-Raising & Advocacy, and Citizen Engagement & Education. The Learning Kits provide innovative and practical approaches to these topics and bring together dozens of outstanding examples from 21 countries across Europe. These digital publications, which were produced with the support of the Creative Europe programme of the European Union, are available online and can be easily read and shared. The Leaning Kits focus on the three key areas discussed during the Capacity Building Days organised by Europa Nostra in 2015, 2016 and 2017 in the framework of its Network project “Mainstreaming Heritage”. These digital publications are a response to one of the main priorities of the project, which was to strengthen the capacity of cultural heritage players throughout Europe and enhance their skills, competences and know-how in the field of heritage conservation, management, fundraising, communication, education and involvement of the youth by facilitating and stimulating peer-learning and exchanges of best practices at European level. These digital publications were prepared by Višnja Kisić, PhD, Researcher and Lecturer, who is also the Secretary General of Europa Nostra Serbia, together with Goran Tomka, PhD, Researcher, Lecturer and UNESCO Chair in Cultural Policy and Management at the University of Arts of Belgrade. The authors will present the Learning Kits for the first time on 19 February in Zagreb on the occasion of the meeting of the Jury of the EU Prize for Cultural Heritage / Europa Nostra Awards 2018 in the category Education, Training and Awareness Raising. The Learning Kits are prefaced by Martine Reicherts, Director-General of DG Education and Culture of the European Commission, and Sneška Quaedvlieg-Mihailović, Secretary General of Europa Nostra. “We believe that these Learning Kits will provide heritage civil society organisations with useful and inspiring approaches to Fundraising, Awareness-Raising & Advocacy and Citizen Engagement & Education. Most of these issues are among the 10 European Initiatives that the European Commission intends to implement in the frame of the European Year of Cultural Heritage 2018. We are therefore proud that these Learning Kits will contribute to the tangible and sustainable legacy of the European Year of Cultural Heritage,” emphasised Martine Reicherts and Sneška Quaedvlieg-Mihailović in their preface. What does the Learning Kit on Fundraising provide? What does the Learning Kit on Awareness-Raising & Advocacy provide? What does the Learning Kit on Citizen Engagement & Education provide?